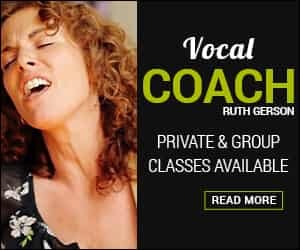 Ruth Gerson has been THE BEST of the best vocal coaches in NYC. She gets exceptional results with singers on all levels. I have been amazed. I recommend her highly whether you’re a beginner or seasoned performer. Lisa Barbaris (Manager, Cyndi Lauper, Simply Red, Mooney Suzuki). Ruth has totally revolutionized my voice and how I think about singing. From my very first lesson, the Singingbelt made it obvious how to breathe and control my breath from the right place in my body. My voice has totally transformed from an instrument that I could sometimes rely on to one that works every time I ask it to. I have studied classical music from the age of four and after the legendary pedagogue, Shinuki Suzuki, Ruth Gerson is the most gifted teacher I have ever had the privilege of working with. The ‘Singingbelt’ is in my subconscious. Discover how to find, develop and preserve your voice. I started taking lessons with Ruth a few months ago and I really noticed a huge difference. I’ve been singing for a long time, but I never really knew what I was doing; the belt really helps you feel what’s going on, [it] has made a huge difference in the way that I sing… I can feel the difference on the inside and people can hear the difference as well. 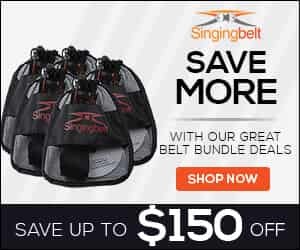 The Singingbelt is an incredible creation; I learned so much in the very first lesson. Ruth is a gifted and brilliant coach. This works and it works fast! It’s amazing. I feel like you are so much more conscious of your breath when you have the belt on. It’s really remarkable how easy it is to sing when you’re singing right and the Singingbelt helps you do that quickly. I used to hear my voice quivering or wavering and now I can hold a steady note confidently, which feels fantastic! I was a beginner and I was struggling to get my breathing under control. The Singingbelt made all the difference; you feel more structure, you feel a lot stronger and in control of your breathing. It’s an instant gratification. You’ll notice a difference straight away. I’ve been using the Singingbelt and practicing Ruth’s techniques for three months now and every day, I feel stronger, and I know I am a much better singer for it. The Singingbelt whipped me into shape. It helped me find my diaphragm and conveyed the concept of breath control in a very physical way that I could understand. Ruth is an amazing teacher. Her technique, eloquence and process have really helped me discover my voice.